First UMC has more than 150 years of history, worship and outreach. 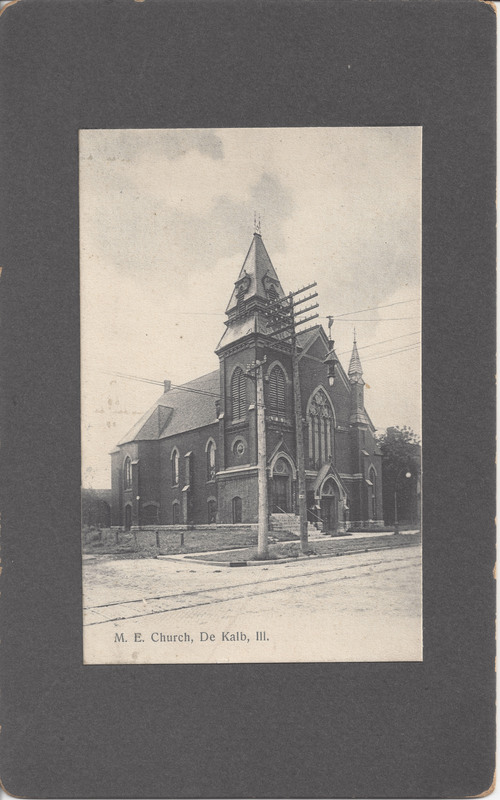 The story of First United Methodist Church begins in 1855 originally as the First Methodist Episcopal Church, was organized in 1855. Elijah Stone officiated over the first two years of services held in a school house located just south of the railroad tracks on First Street. In 1858 the congregation erected its own church building on Fourth and Grove Streets. First Methodist moved again in 1909 to the present structure on Fourth and Oak Streets (pictured at right) and purchased the house on the southwest corner of First and Locust Streets as a parsonage. Construction of the Education Wing (1958) and today’s expansions and renovations continue as First UMC continues to attract people of all ages throughout the week and on Sunday mornings. Over the years, members of the First United Methodist Church participated in several community service church groups. The Ladies’ Aid Society, instrumental in raising funds for church improvements and charities, began in 1855. Sub-groups or Circles of the Society worked towards accomplishing specific goals. The women congregants also formed three missionary societies; the Foreign Missionary Society organized in 1884, the Young Women’s Missionary in 1886, and finally, the Home Missionary Society started in 1897. In addition, young people’s organizations, particularly the Epworth League (org. 1890) and Harmony Circle (org. 1907), provided a social and educational atmosphere for teen-age members. Lastly, church members helped form the DeKalb areas first Scouting troops: Girl Scout Troop 102, Boy Scout Troop 4, and Cub Scout Pack 104. All of these organizations insure the continued development and involvement of the First United Methodist Church in the DeKalb community.